Last December I was handling a lot of traffic on the National Traffic System nets. I was the liaison between Virginia and 4RN, between 4RN and EAN, and was filling in on an open TCC slot. Come to think of it, I was also handling quite a bit of traffic as a Digital Relay Station as well. By the end of the month I had handled 546 messages using almost every mode known to NTS. I knew the days of handling lots of traffic were coming to an end, at least in the short run, as my first little harmonic was born at the beginning of December. Luckily for me, he enjoyed listening to the radio; it seemed to soothe him. But as January came around I had to let it all drop. I've just recently gotten back active in NTS and, while I probably won't be able to get the numbers I was getting before, I'm hoping I can start making some time to move traffic around. 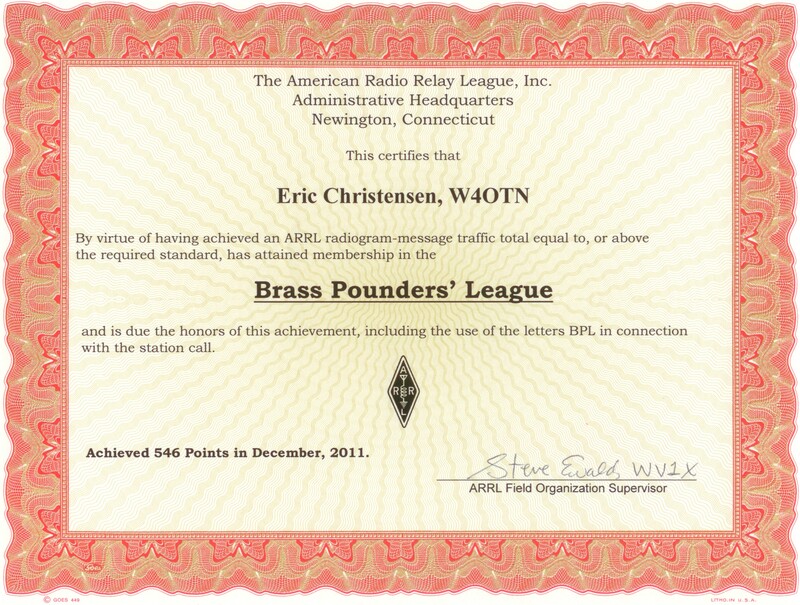 Last week I was looking at my records and remembered that I had finally qualified for the Brass Pounders' League but never officially asked for the certificate. A quick e-mail to Steve WV1X solved that problem and I received my certificate in the mail today (thanks Steve!). It will be displayed promonately next to my DXCC as I feel it was just as difficult a challenge and I'm proud of both.